TOGETHER WE CREATE VALUE TRADE • NETWORKING • INDUSTRY INSIGHTS • UPDATED KNOWLEDGE Once again in 2020, the industry comes together in Fredericia, for Denmark’s specialist trade fair for livestock producers. NutriFair provides the framework for a professional forum, where suppliers can meet decision makers for networking, inspiration and making deals. NutriFair is a very focused trade fair, concentrating on a high standard of professionalism and the latest knowledge. NutriFair invites you to a very strong programme of talks and conferences, presenting a wide variety of highly-topical industry content. DECISION-MAKING FARMER NutriFair’s visitors are decision makers and important figures from the world of agriculture. At NutriFair 2019, as many as 79 % of visitors had the authority to make purchases on behalf of their businesses. Some of the reasons why our visitors attend include: 96% attend to find inspiration and keep themselves updated about developments. 91% attend to see what is new in the industry. 90% attend to cultivate their network. 68% attend with an interest in future investments. NutriFair is constantly evolving, and 2020 will be no exception. A number of new initiatives have been launched, which will be presented on NutriFair’s website in the lead-up to the fair in 2020. We can already reveal that the conference stage will be moving into hall D and will be packed with exciting presentations that take an in-depth look at highly topical, industry-related themes. Invitations to attend, which can be sent out to customers and potential customers. Email signature, with a note about own stand at the fair. Exhibitors are encouraged to send us news for inclusion in press releases, as well as on the NutriFair website and social media profiles. NutriFair is arranged in close collaboration with a number of industry-leading stakeholders. The professional level of this event is improved with each new edition of NutriFair, thanks to a broadly based fair committee, close relations with powerful industry associations and a dynamic dialogue with media, exhibitors and visitors. The price does not include construction of the stand. Technical services such as electricity, lighting and carpeting should be ordered separately. 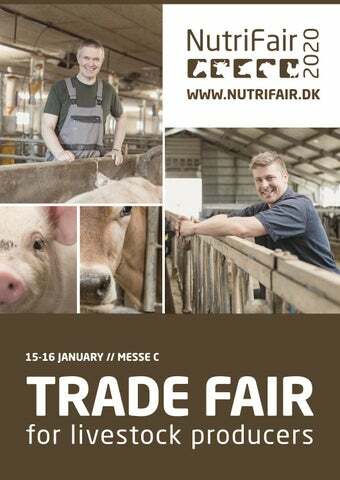 BOOK YOUR STAND NOW Book your stand on www.nutrifair.dk, call us or send us an email. REGISTRATION FEE Registration fee of DKK 2.495,- per exhibitor. The registration fee is mandatory for all exhibitors. All prices are excluding VAT.